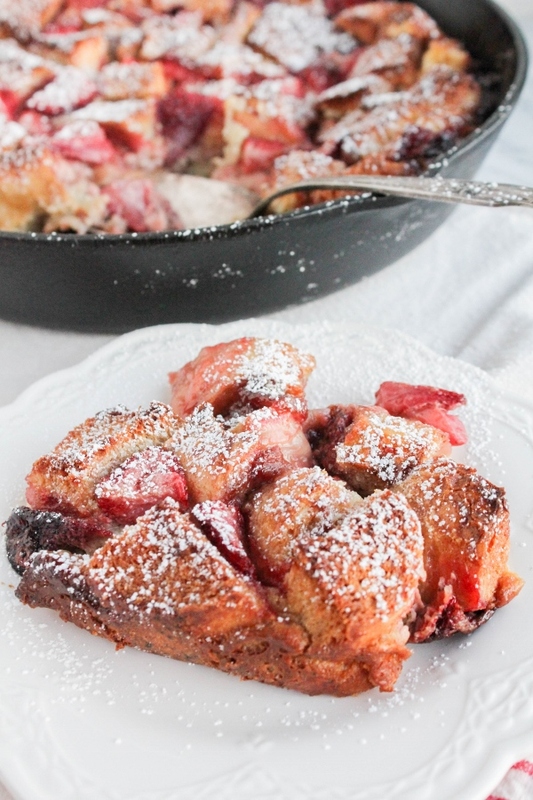 bread pudding and is perfect for breakfast or brunch! Happy Saturday! It's been a long week and I am thrilled that the weekend is finally here. I had a crazy week at work, then my laptop decided to die on me. It's been in the shop for a few days and I finally got it back last night, but unfortunately that meant I missed a few days of brunch week. 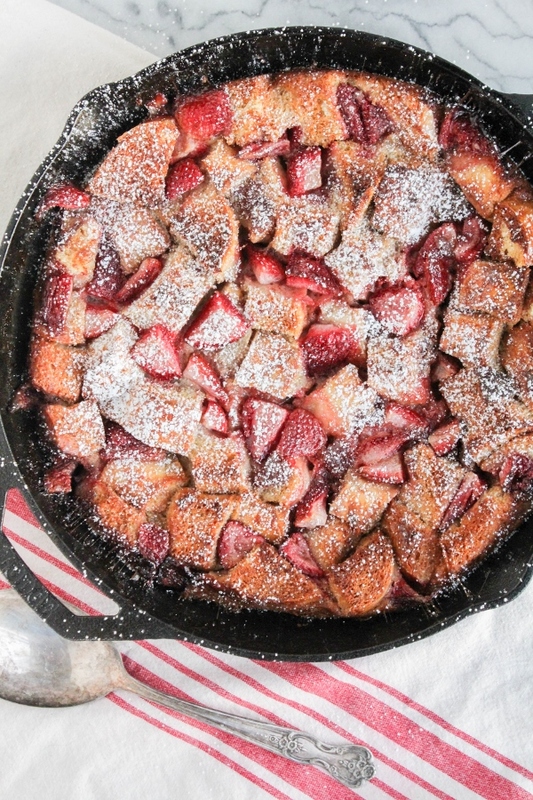 I'm so bummed I didn't get a chance to share a couple of my favorite recipes with you, but I'm very excited to end the week with this amazing Strawberry Bread Pudding! 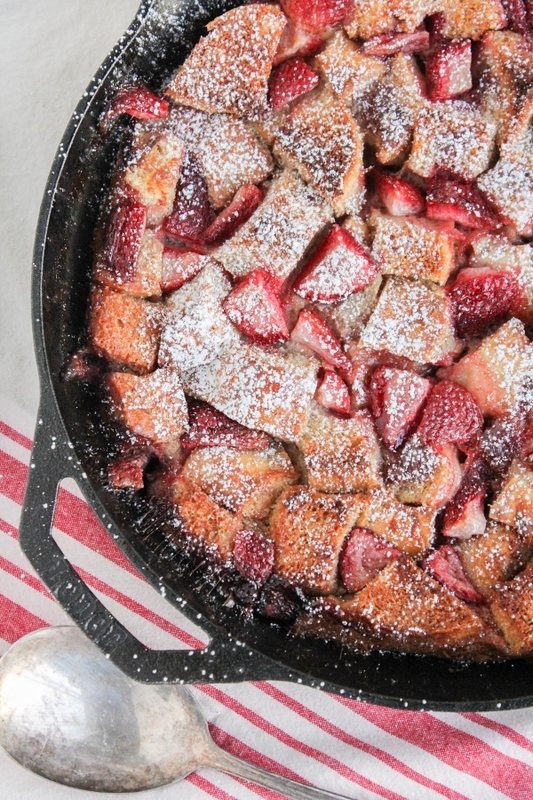 A twist on traditional bread pudding, it's full of fresh strawberries and strawberry preserves, making it the perfect dish for breakfast or brunch. Are you a sweet or savory brunch lover? Although I enjoy a good savory dish, I love my sweets. Waffles, pancakes, cinnamon rolls, I love it all. 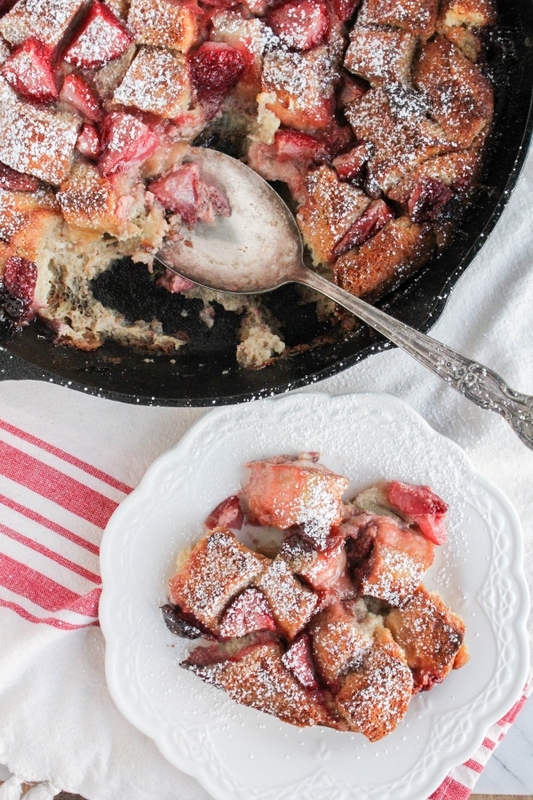 This Strawberry Bread Pudding has quickly become one of my new favorite brunch dishes. Made with cubes of French bread, Eggland’s Best Eggs, Dixie Crystals Granulated Sugar, fresh strawberries and strawberry preserves, it's decadent and delicious and perfect for feeding a crowd. I love this recipe because it's so simple to make. 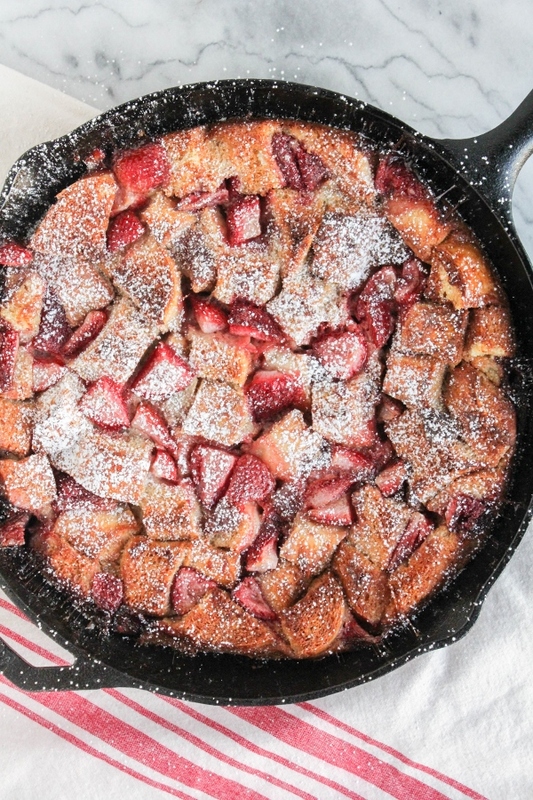 One bowl and one cast iron skillet is all you need. It can be prepped the night before and baked the next morning, so no stressing out on brunch day! I hope you will love this delicious dish as much as my family does! Be sure to check out the other amazing #BrunchWeek recipes today, and don't forget to enter the giveaway! Spray a large cast iron skillet or baking dish with non-stick cooking spray. Spread the bread cubes evenly in the prepared pan. In a large bowl, whisk together the eggs, heavy cream, milk, preserves, sugar, butter, vanilla and cinnamon until well combined. Add the strawberries and stir well. Pour the mixture evenly over the bread cubes, pressing down to make sure all the bread cubes are coated. Cover and refrigerate for at least one hour, or overnight. Preheat the oven to 350 degrees. Bake for 1 hour to 1 hour and 15 minutes, until golden brown and the dish is set in the center. Remove from the oven and let stand for 15 minutes. Dust with powdered sugar.